Nigella promoted her cookbook in several different TV shows here in Brazil and in one of them she baked her chocolate banana muffins – she said that they would be a nice treat for breakfast on Mother’s Day. Her comment reminded me of this recipe I cooked a while ago, the first one I tried from Martha’s wonderful vegetarian cookbook : I find it perfect for a celebration day, since it can be put together in advance and kept covered in the refrigerator; all you need to do is let it come to room temperature, then bake it – easy-peasy. Make the sauce: in a medium saucepan, heat the olive oil over medium-high heat. Add the onions and cook until translucent. Add the garlic, cook for 1-2 minutes, then add the tomatoes and the sugar. Fill 1/3 of the can with water, swirl it around and add to the saucepan. Season with salt and pepper, break the tomatoes with a wooden spoon then cook over medium heat, stirring occasionally, for about 20 minutes or until slightly thickened. Add the basil and oregano, stir to combine, cover and remove from the heat. Cook shells in a large pot of salted boiling water until al dente. Drain and let cool. Preheat the oven to 180°C/350°F. Filling: in a small saucepan, heat the olive oil over medium-high heat. Add the garlic, cook for about 1 minute or until fragrant. Add the spinach and cook until it thaws, breaking it up with a wooden spoon. Season with salt, pepper and nutmeg and remove from the heat. Cool slightly. In a large bowl, mix together the ricotta, parmesan, spinach and parsley. Season again with salt and pepper. Coat a 25x15cm (6x10in) ovenproof baking dish with the sauce. Generously spoon filling into shells and arrange in pan, dipping them into the sauce. Cover with foil and bake until bubbling, about 30 minutes. I love stuffed shells, these look delicious! Adding nutmeg to the filling is a wonderful idea :). For years now, I have been making these, following your recipe. It's a fave amongst guest, my husband - and the most critical person of all - my mother. 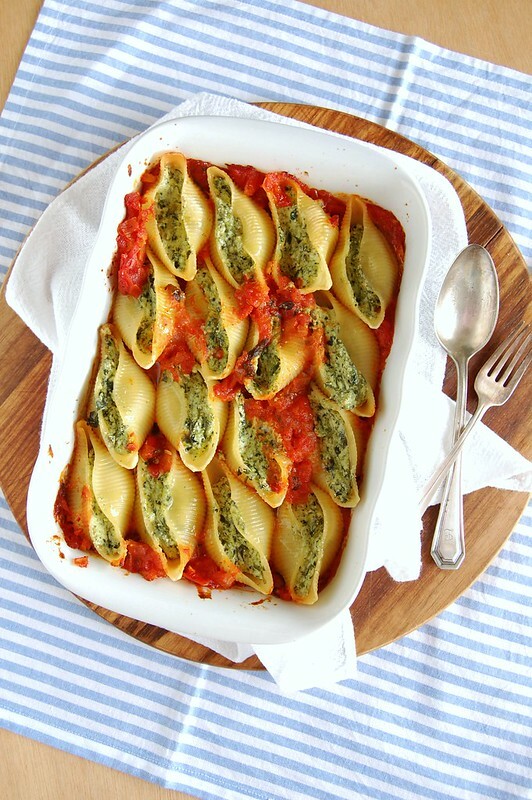 I have linked your recipe to my blog long ago: http://jesterskitchen.tumblr.com/post/53512831072/foodfuckery-ricotta-and-spinach-stuffed-shells#notes (btw. did you know you got a lot of love for this one on tumblr?) and I'm about to make them again tomorrow. This is why I finally decided to let you know how marvelous this recipe is. Thank you for sharing. Thank YOU for writing to me, your comment made my day!